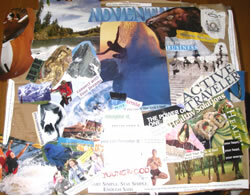 Its an oldie but a goodie, the Vision Board exercise. Sometimes called a Vision Collage, Treasure Map, Vision Map, etc. A wonderful ‘visual’ way to define and align with what you really want. In the underground hit movie The Secret (introductory movie on Law of Attraction principles), there is a scene where a man unpacks and shows his Vision Board to his young son, only to realize that they are now living in the very house that was pictured on his board (created several years prior). And, during one of Oprah’s shows, guest Lisa Nichols showed her Vision Board – in it were the words ‘Lisa Reveals All on Oprah’ … she definitely manifested that one! Time and again I hear from my own clients about just how successful this classic tool is and I take delight in their stories and the fun of their manifestations. Like the physician who placed a photo of a cute little boy poking his head from a drawer in the middle of his Vision Board … and a year later hearing the beautiful pride and love in his voice as he catches up with me about what life is now like with a baby in the house (way to go Morgan!). 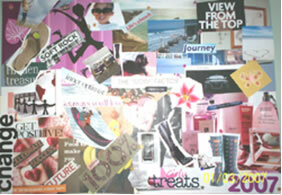 Vision boards help you define and clarify what your desire. They help make your dreams and goals more tangible and solid. Through them you form an energetic bond with what you want. They act as guiding lights or north stars – helping you realize and commit to your Personal Vision. Yes, they are fun and creative to do; however don’t let their simplicity fool you – they are also very powerful magnetization and manifestation tools. Acting as little energy vortexes if you will – that tell your sub-conscious mind what to focus on and create. 1. Assemble Your Materials: Collect together a pile of magazines, scissors, a glue stick (or tape), and some markers. You’ll also need some sort of sturdy backing (like a poster board, large sheet of paper … even a few paper bags cut open and taped together will work). 3. Set Your Intention: Set the intention that you are going to create a vision collage for yourself. This means just tell yourself that you are going to create a great Vision Board for yourself and that you are going to find the perfect images and words to represent your desired future. Auto suggestion is a good tool (pre-paving what you want to happen goes a long way). 4. Determine Time Frame (or not): You may or may not want to create a time frame for your vision (i.e. 6 months, 1 year, 3 years, 5-10 years … whatever feels right for you). Or, if it doesn’t feel good to put on a timeframe, then just call it your ASAP vision – leaving timing up to ‘greater forces’. 6. Assemble What You’ve Got: Once you’ve got a nice stack of images …turn next to assembling them onto your poster board (or whatever backing you are using). There is no right or wrong way to create a Vision Board. Just do what feels right for you. You might want to arrange your images and play around with them a bit … then finally tape or glue it all down. 7. Extract the Essence: After creating your Vision Board, debrief the experience and harvest out what you have learned about your desired future. I call this “Extracting the Essence”. Pull out your main themes. You can do this yourself, or present your Vision Board to a trusted friend, colleague or loved one and have them help you decipher the essence of what it is you want. Great for understanding one another and seeing what each other wants in life. In conclusion: I’ve done many Vision Boards over the last 15 years. I love them. And I consistently get what I picture – if not the exact thing then at least the essence of what it represents. My clients have the same results. The point is not so much to wrestle what you want to the ground. It’s more about having fun, putting yourself into a good vibration and feeling good about things that you like and want. Finding out about yourself. Sometimes it’s not always easy to determine what you want – the Vision Board exercise is a great to sneak up on this stuff. To find out what you want in a fun and relaxed way. For many examples of Vision Boards, see previous blog posts here. Try a Vision Board for yourself. Have fun with it. And be sure to write me with your manifestation stories – I love hearing them! This Vision Board exercise is just one of the manifestation tricks we do in my SHIFT-IT Virtual Group – so if you are keen to meet and collaborate with like-minded people from around the globe, all on their own SHIFT-IT journey, come join us – groups are offered online twice a year. to leave comments and read those left by others.